Artabotrys R. Br. is one of the largest genera of the custard apple family, Annonaceae. The class Artabotrys comprises through 128 genera and 2000 species. Out of 2000 species, 100 species are in the Paleotropics and disseminated basically to tropical furthermore subtropical locales of the world, particularly tropical Africa and Eastern Asia. Seven species have been recorded from India. Artabotrys hexapetalus a medicinal plant as a whole known by its common name in India as “Manorangini.” A. hexapetalus is also known by an array of names such as Hari Champa in Hindi, climbing Ylang Ylang in English, Hara Champaka in Sanskrit, Katchampa in Bengali and Monoranjana in Telugu. Apigenin (4′, 5, 7-trihydroxyflavone) and quercetin (3, 3', 4, 5, 7-Penthydroxyflavone) both are polyphenolic compounds derived from phenylpropanoid metabolic pathway. They are plant-derived aglycone form of flavonoid glycosides. They have been used as a nutritional supplement and may be beneficial against a variety of diseases. Some of the beneficial effects include cardiovascular protection, anticancer, antitumor, anti-ulcer, anti-allergy, antiviral, anti-inflammatory activity, antidiabetic, antimutagenic, antioxidant, gastroprotective effects, antihypertensive, immunomodulatory and anti-infective. Both the compounds are bioactive constituents of A. hexapetalus. Till date, various analytical methods are available for analysis of quercetin individually but not for apigenin. However, literature survey shows no single quantitative method available for simultaneous estimation of quercetin and apigenin from A. hexapetalus or any other plant. Therefore, there is necessity to develop a simple and accurate method for simultaneous estimation and quantification of these two phytotherapeutic compounds using sophisticated instruments such as high-performance thin layer chromatographic (HPTLC). A. hexapetalus (Annonaceae) is widely distributed throughout the southern part of China. In a Chinese traditional folk medicine, its roots and fruits are used for treating malaria and scrofula respectively. Leishmaniasis and malaria both are parasitic diseases which are the cause of mortality of millions per year. Treatment of leishmaniasis is very limited. Leishmaniasis appears to be far more abundant and of greater public health importance than was previously recognized. Although accurate quantitative evaluation is difficult, the WHO estimates that approximately 350 million people in the world are at risk of acquiring one or the other form of leishmaniasis and that about 12 million persons are currently infected. Viscerotropic species, such as Leishmania infantum and Leishmania donovani, cause visceral leishmaniasis (VL) or kala-azar, which is fatal if not treated. VL is caused by L. donovani. Its first-line treatment is with pentavalent antimony compounds, but they have toxic effects and are expensive too. The selection of bioactive molecules is initiated by specific screening of plant extracts, isolation by activity directed fractionation and identification of the active compound. The simplest method uses upon the promastigote stage of Leishmania species. In the present study, a simple, accurate and rapid HPTLC method for simultaneous determination and quantification of quercetin and apigenin has been developed and the extracts were further evaluated to investigate in vitro anti-hyperproliferative effect of the polar (ethanol [ETAH] and aqueous extracts [AQAH]) and nonpolar (petroleum ether [PEAH] and dichloromethane [DCMAH]) compound enriched fraction against L. donovani. Standard quercetin (purity 99% w/w) and apigenin (purity 97.8%, w/w) were purchased from Natural Remedies Pvt. Ltd, Bengaluru, India. 3-(4,5-dimethylthiazol-2-yl)-5- (3-carboxymethoxyphenyl)-2-(4-sulfophenyl)-2H-tetrazolium (MTT) was procured from Sigma-Aldrich, USA. Tobie medium, amphotericin B and dimethyl sulfoxide (DMSO) were of molecular biology grade. Precoated silica gel 60 F254 HPTLC plates were purchased from E. Merck, Germany. All the solvents used were of chromatography grade and other chemicals used were of analytical reagent grade. Plant materials (leaves, twigs, aerial parts and roots) were collected from the nursery of Roshanara Bagh, New Delhi, between November 2013 and January 2014. Voucher specimen was authenticated by Dr. Sunita Garg, Scientist F and Head, Raw Material Herbarium and Museum, NISCAIR (National Institute of Science Communication and Information Resources) Pusa Gate, New Delhi. The voucher specimen (NISCAIR/RHMD/consult/2014/2546/125) of the test drug was deposited in the NISCAIR herbarium for future reference. The fresh aerial parts were dried under shade and powdered in a mixer. The coarse powdered material (500 g) of A. hexapetalus was extracted successively by petroleum ether, dichloromethane, ethanol and distilled water. Each time before extraction with next solvent, the coarse powder material was dried in hot air oven below 50°C. The extract was evaporated to dryness under reduced pressure with a rotary evaporator (Heidolph) at a temperature of 40°C while the water filtrate was freeze-dried to powder. Yields for each extraction are indicated in [Table 1]. All the dried extracts were kept in tightly packed container under refrigeration until used for the biological testing. Each extract (100 mg) was dissolved in 10.0 mL of High Performance Liquid Chromatography (HPLC) grade methanol in a 10 mL volumetric flask to get 10 mg/mL solution. These solutions were sonicated (Metrex) and filtered through 0.22 μm syringe filter and then these solutions were used as test solution for HPTLC analysis. A Camag (Muttenz, Switzerland) HPTLC system, including a Linomat v programmed utensil for a 100 μL syringe, a twin trough chamber, Camag thin-layer chromatography (TLC) scanner 3, win CATS software, were utilized. Those specimens were connected on triplicate (8. 0 μL each) furthermore were spotted in the type from claiming groups Hosting bandwidth for 4 mm around precoated silica gel 60 F254 HPTLC plate (4 cm × 10 cm, 20 mm thickness) (Merck). A Camag (Muttenz, Switzerland) HPTLC system, including a Linomat V automatic applicator with a 100 μL syringe, a twin trough plate development chamber, Camag TLC scanner 3 and win CATS software, were utilized. The samples were applied in triplicate (8.0 μL each) and were spotted in the form of bands having bandwidth of 4 mm on precoated silica gel 60 F254 HPTLC plate (4 cm × 10 cm, 20 mm thickness) (Merck). The plates were developed vertically ascending in a twin-trough glass chamber (Camag, Switzerland) saturated with respective mobile phase. The optimized chamber saturation time for the mobile phase was 30 min at room temperature (25°C ± 2°C). The chromatographic run period length was 90 mm from the bottom edge of the plate. The chromatogram was developed up to 85% of total TLC plate height. Subsequent to the development, HPTLC plates were dried in an oven for 5 min at 60°C for complete removal of the mobile phase. The wavelengths for fingerprinting were chosen by multi-wavelength scanning, showing the highest number of peaks. The peak numbers with its height and area, peak display and peak densitogram were evaluated. The quantification of quercetin and apigenin in various extracts were carried out for quality control of crude drugs. Densitometric scanning was performed with a TLC scanner equipped with win CATS 1.4.2 software (Camag, Switzerland) in reflectance absorbance. The plate was kept in photodocumentation chamber (CAMAG REPROSTAR 3) and captured image at 254 nm. Stock solutions of quercetin and apigenin were prepared in HPLC grade methanol. The stock solutions of quercetin and apigenin were applied in triplicate in different volumes (0.1–10 μL) on HPTLC plate and eluted using toluene: ethyl acetate: formic acid, 6.5:3:0.5, v/v/v as solvent system. The quantification was done by scanning the developed chromatograms at 254 nm for quercetin and apigenin without derivatization. Different volumes (0.1–10.0 μL/spot) of the standard solutions (quercetin and apigenin) were separately spotted on TLC plates (in triplicate) to obtain different concentrations of quercetin (100–1000 ng/spot) and apigenin (100–2000 ng/spot) for calibration plots. The data of peak area versus drug concentration were treated by linear least-square regression and the concentration range showing best regressions was considered for linearity. Precision of the proposed method was obtained by repeatability and intermediate precision. Interday and intraday precisions were done by preparing and applying three different concentrations of standards (in triplicate) on the same day and on three different consecutive days respectively. The interinstrumental and interanalyst precision was carried out by repeating the same procedure using different systems of the same make and by different analysts respectively. Precision studies were done at three different concentration levels. The results were determined and reported in terms of % RSD. Robustness of the analytical procedure is a measure of its capacity to remain ineffective by small, but deliberate variations in the method parameters and provide an indication of its reliability during normal usage. Robustness of the method was achieved by introducing small changes in the compositions of mobile phase and detection wavelength. The specificity of the method was ascertained by analyzing standard drug and sample. The detection of spots for quercetin and apigenin were confirmed by comparing Rf and spectra of spots with those of the standards. The peak purity was assessed by comparing the spectra at three different levels, that is peak start, peak apex and peak end positions of the spot. The LOD was expressed as LOD = 3.3 σ/slope, whereas LOQ was expressed as LOQ = 10 σ/slope, where σ is the standard deviation of the response at low concentrations and slope = the slope of the calibration curve. In analytical methods, the closeness of test results obtained by that method to the theoretical value is called the accuracy. The standard addition method was used by spiking at four different concentration levels, that is 0%, 50%, 100% and 150% of analyte in preanalyzed samples. The newly developed method was applied for simultaneous estimation of quercetin and apigenin in PEAH, DCMAH, ETAH and AQAH extract of A. hexapetalus. The samples were applied in triplicate on HPTLC plates with standard and the contents of metabolites were analyzed, using regression equations obtained from calibration plots and expressed as %w/w. All the extracts showed number of ultraviolet (UV) active compounds and thus detected at 254 nm after visualization without derivation. L. donovani in cultured promastigote form used in this work were procured from the laboratory of National Communicable Disease Control Programme, New Delhi. Promastigotes were grown in modified tobie medium, which consists of two phases blood agar (solid phase) and Locke's solution (liquid phase), 5 mL of solid phase was dispensed in to 25 mL flask and just before use and 2 mL of Locke's solution was added to the flask. Then, the flask was incubated at 24°C for 72 h. After 3 days, the mortality was recorded by counting the live promastigotes in Neubauer's counting chamber. Promastigote forms from a logarithmic phase culture were suspended to yield 1 million of cells/mL after Neubauer chamber counting. Each well of 96 well plate was filled with 100 μL of the parasite suspension and the plates were incubated at 24°C for 1 h before drug addition. Data represented as the mean ± standard deviation (SD) from three independent assays. The IC50 values were calculated using dose-response curves in GraphPad Prism 5.0 software (California, USA). Differences between mean values were accepted as significant when P < 0.05. The plant material was extracted using successive hot extraction by Soxhlet apparatus and then lyophilized. The hot extraction was selected for the present study due to its high yields and the yield obtained were PEAH (1.499%), DCMAH (0.892%), ETAH (7.486%) and AQAH (11.18%). As far as available information, there is no method reported to quantify quercetin and apigenin simultaneously in A. hexapetalus. Therefore, an attempt has been done and validate a cost-effective simple method to quantify bioactive marker components for this herb. Chromatogram was developed for both quercetin and apigenin, together under chamber saturation conditions using toluene: ethyl acetate: formic acid (6.5: 3: 0.5, v/v/v), as mobile phase [Figure 1]. The same mobile phase has been also employed for the separation of various extracts of A. hexapetalus. UV spectra measured for the spots showed maximum absorbance at about 254 nm, therefore, UV densitometry analysis was performed at 254 nm in the reflectance mode. 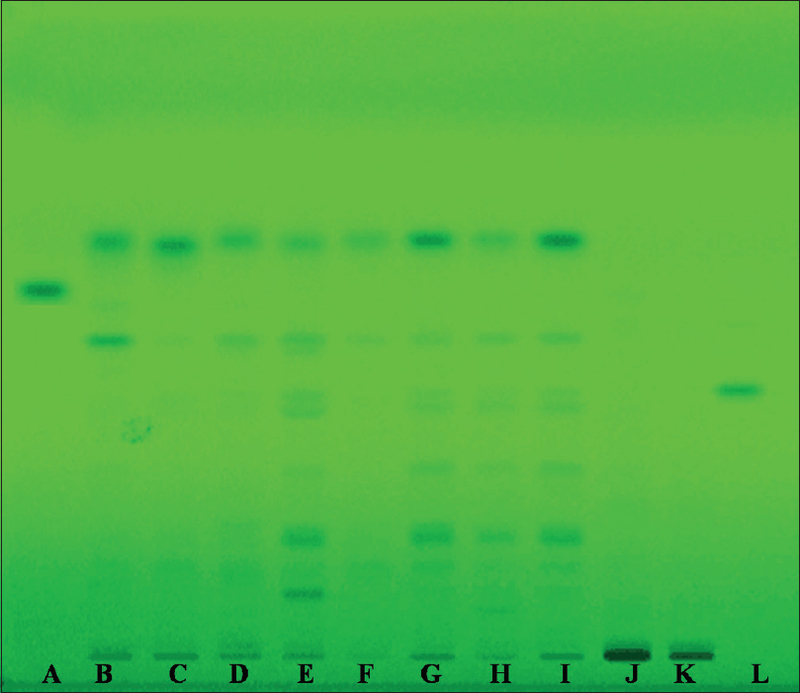 High-resolution bands were obtained which were sharp and symmetrical having Rf values of 0.52 ± 0.001 and 0.73 ± 0.002 for quercetin and apigenin respectively. This method was specific for evaluation of the extracts since no overlapping of peak was observed. The HPTLC chromatograms of quercetin, apigenin and extracts of A. hexapetalus are depicted in [Figure 2]. In addition, this helped in generating a better fingerprinting data, whereby species could be well differentiated on enhanced visual identification of individual compounds. Different volumes (0.110 μL) of the standard solutions were separately spotted on the TLC plates to obtain different concentration of standards. The linearity was evaluated by data of peak area versus drug concentration, as it was treated using linear least-square regression and the concentration range showing best regressions was considered for its linearity. The regression equation with slope, intercept and coefficient of correlation (R2) were calculated and are given in [Table 1]. LOD and LOQ of different markers were calculated as per the standard protocol and reported in [Table 1]. The lower LODs obtained for quercetin and apigenin were 15.56 and 13.78 ng/spot respectively, with good linearities, while the LOQ obtained was 51.88 and 45.94 ng/spot, respectively, indicating the sensitivity of the method to be adequate. 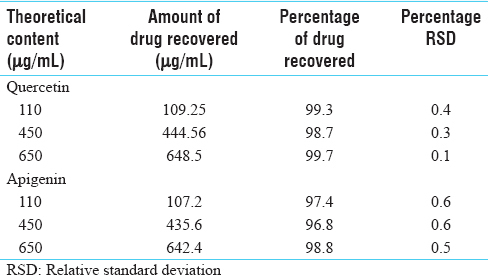 Developed method was found accurate (% recovery 98.7–101.0%; %RSD <2%). The results are depicted in [Table 2]. The precision method and intermediate precision are expressed as RSD (%) and given in [Table 2]. Intraday and interday precision were studied by triplicate assay of three different concentrations of quercetin and apigenin (200, 400 and 600 ng/spot), respectively, on the same day and on 3 different days. Obtained low RSD values indicated that the method is precise and reported in [Table 3]. The low value of SD and %RSD obtained after introducing small deliberate changes in the experimental conditions and results were examined. The results given in [Table 4]. The newly developed and validated HPTLC method was applied for the simultaneous estimation of quercetin and apigenin in various extracts of A. hexapetalus. The amount of quercetin in various extracts of drug, that is PEAH, DCMAH, ETAH and AQAH were found to be 0.54% w/w, 0.35% w/w, 2.64% w/w and 4.26%w/w respectively, whereas the values for apigenin were found to be 0.64% w/w, 1.24% w/w, 5.84% w/w and 8.46% w/w respectively [Table 5]. Different concentrations of successive extracts of A. hexapetalus were evaluated for their in vitro effects against the L. donovani promastigotes. The lowest concentration of the test compound that prevented the growth of L. donovani parasites in vitro was considered as the maximum inhibitory concentration. Similarly, activity of A. hexapetalus extracts against L. donovani was investigated. The extracts of plants and amphotericin B inhibited the growth of promastigote forms of L. donovani in vitro after 24, 48, 72 and 96 h of incubation and had 50% inhibitory concentration (IC50) that are shown in [Figure 3] and [Figure 4]. Up to 1.0% (v/v), DMSO had no effect on parasite growth rate and mobility morphology. All the extracts showed antileishmanial activity in a dose-dependent manner at 24 and 48 h of incubation. Despite longer incubation period at 72 h, all extracts showed moderate antiparasitic activity due to log phase of L. donovani. The results of antileishmaniac activity exhibited that extracts of A. hexapetalus are having antileishmaniac activity. In the preliminary study, the extracts exhibiting >40% inhibition at the tested concentrations, were considered to have high antileishmanial potential and are considered to be tested further on the L. donovani macrophage infection assay. 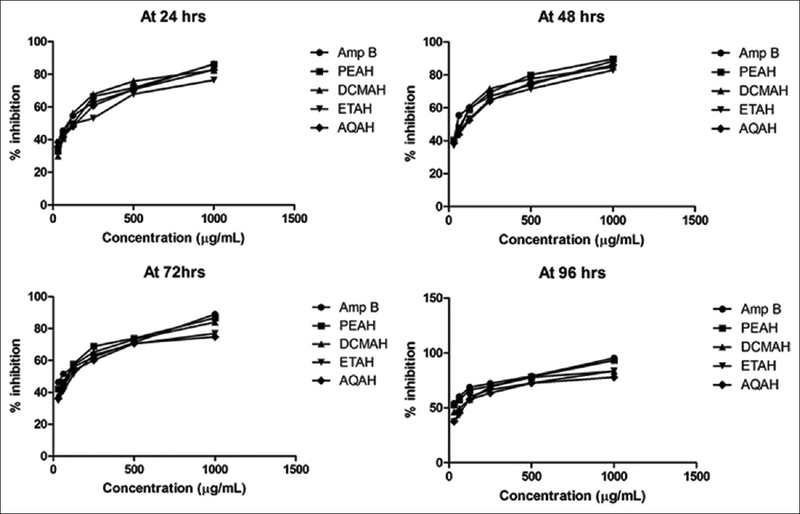 The PEAH extract exhibited the highest inhibition percentage of L. donovani (93.29 ± 0.58%) at 1000 μg/mL and (78.23 ± 0.89%) at half of this concentration at 96 h. In addition, DCMAH, ETAH and AQAH extracts showed 50% inhibition at 500 μg/mL and there was 5%–10% reduction of the inhibition percentage at half of this concentration at 96 h [Figure 3]. 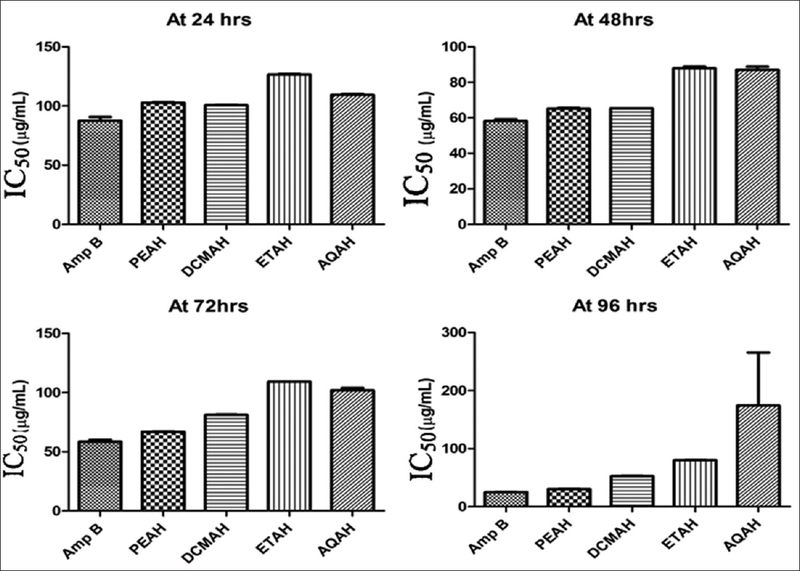 The IC50 and percentage inhibition for DCMAH, ETAH and AQAH were significantly lower (P < 0.001) as compared with amphotericin B (P > 0.05) at 96 h. The PEAH extracts of plant were found to have higher activity followed by DCMAH, ETAH and AQAH extracts of the plant as shown in [Figure 4]. The antileishmanial effect of extracts of A. hexapetalus was evaluated in vitro, and it was found that they have relatively good antileishmanial effects. This study provides an important basis for further investigations and may be used together with known drugs in the development of pharmacological agents to combat leishmaniasis. The developed hyphenated HPTLC method for the simultaneous quantification of above marker compounds is simple, precise, specific, sensitive and accurate. Further, this method may be effectively used for routine quality control of herbal materials as well as formulations containing any or both of these compound (quercetin and epigenin). Murphy BT, Cao S, Brodie PJ, Miller JS, Ratovoson F, Birkinshaw C, et al. Antiproliferative compounds of Artabotrys madagascariensis from the Madagascar rainforest. Nat Prod Res 2008;22:1169-75. Kessler PJ. Annonaceae. In: Flowering Plants Dicotyledons. Berlin, Heidelberg: Springer Berlin Heidelberg; 1993. p. 93-129. The Wealth of India. A Dictionary of Indian Raw Materials & Industrial Products. Revised Edition. New Delhi: Publications & Information Directorate, Council of Scientific & Industrial Research; 1985. p. 433-4. Mahidol C, Chimnoi N, Chokchaichamnankit D, Techasakul S. Identification of volatile constituents in Artabotrys hexapetalus flowers using simple headspace solvent-trapping technique in combination with gas chromatography-mass spectrometry and retention indices. Acta Hortic 2005;677:43-50. Ranganathan R, Vijayalakshmi R, Parameswari P. Ethnomedicinal survey of Jawadhu Hills in Tamil Nadu. Asian J Pharm Clin Res 2012;5 Suppl 2:45-9. Lan YH, Wang HY, Wu CC, Chen SL, Chang CL, Chang FR, et al. New constituents from stems of Artabotrys uncinatus. Chem Pharm Bull (Tokyo) 2007;55:1597-9. Lal HS, Singh S. Study of plant biodiversity of Hazaribag district Jharkhand India and its medicinal uses. Biosci Discov 2012;3:91-6. Falcone Ferreyra ML, Rius SP, Casati P. Flavonoids: Biosynthesis, biological functions, and biotechnological applications. Front Plant Sci 2012;3:222. Xiao J, Kai G, Ni X, Yang F, Chen X. Interaction of natural polyphenols with α-amylase in vitro: Molecular property-affinity relationship aspect. Mol Biosyst 2011;7:1883-90. World Health Organization. WHO Report on Global Surveillance of Epidemic-Prone Infectious Diseases: Leishmaniasis and Leishmania/HIV Co-Infection. Geneva, Switzerland. World Health Organization; 2000. p. 120-1.
WHO Expert Committee. Control of the Leishmaniases: Report of a WHO Expert Committee. Geneva, Switzerland: World Health Organization; 1990. p. 158. Callahan HL, Portal AC, Devereaux R, Grogl M. An axenic amastigote system for drug screening. Antimicrob Agents Chemother 1997;41:818-22. Wagner H, Bladt, S. Plant Drug Analysis: A Thin Layer Chromatography Atlas. 2nd ed. Berlin: Springer-Verlag. Springer International Publishing; 1998. Harborne JB, Jeffrey B. Phytochemical Methods: A Guide to Modern Techniques of Plant Analysis. 3rd ed. New York.hapman and Hall; 1998. 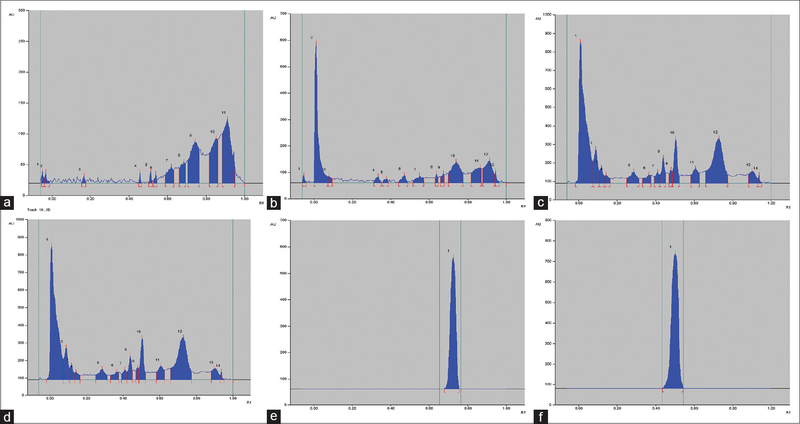 Ahamad J, Hassan N, Amin S, Mir S. Development and validation of a high-performance thin-layer chromatographic-densitometric method for the quantification of swertiamarin in traditional bitters and formulations. J Planar Chromatogr Mod TLC 2015;28:61-6. Senguttuvan J, Subramaniam P. HPTLC fingerprints of various secondary metabolites in the traditional medicinal herb Hypochaeris radicata L. J Bot 2016;2016:1-12. Tobie EJ, Von Brand T, Mehlman B. Cultural and physiological observations on Trypanosoma rhodesiense and Trypanosoma gambiense. J Parasitol 1950;36:48-54. Qureshi NA, Ur Rahman H, Ali A, Aizaz Ali Shah S, Khan I. In vitro evaluation of the anti-leishmanial activity of Euphorbia helioscopia stem extract in comparison with synthetic drug amphotericin B. Asian J Nat Appl Sci 2014;3:12-17. Kigondu EV, Rukunga GM, Keriko JM, Tonui WK, Gathirwa JW, Kirira PG, et al. Anti-parasitic activity and cytotoxicity of selected medicinal plants from Kenya. J Ethnopharmacol 2009;123:504-9. Dorin D, Le Roch K, Sallicandro P, Alano P, Parzy D, Poullet P, et al. Pfnek-1, a NIMA-related kinase from the human malaria parasite Plasmodium falciparum biochemical properties and possible involvement in MAPK regulation. Eur J Biochem 2001;268:2600-8. Odonne G, Herbette G, Eparvier V, Bourdy G, Rojas R, Sauvain M, et al. Antileishmanial sesquiterpene lactones from Pseudelephantopus spicatus, a traditional remedy from the Chayahuita Amerindians (Peru). Part III. J Ethnopharmacol 2011;137:875-9. Ali N, Ahmed G, Shah SW, Shah I, Ghias M, Khan I. Acute toxicity, brine shrimp cytotoxicity and relaxant activity of fruits of Callistemon citrinus curtis. BMC Complement Altern Med 2011;11:99. Sharma U, Velpandian T, Sharma P, Singh S. Evaluation of anti-leishmanial activity of selected Indian plants known to have antimicrobial properties. Parasitol Res 2009;105:1287-93. Cory AH, Owen TC, Barltrop JA, Cory JG. Use of an aqueous soluble tetrazolium/formazan assay for cell growth assays in culture. Cancer Commun 1991;3:207-12. Lima JP, Pinheiro ML, Santos AM, Pereira JL, Santos DM, Barison A, et al.In vitro atileishmanial and cytotoxic activities of Annona mucosa (Annonaceae). Revista Virtual de Quimica; 2012;4:692-702. Thakur CP, Narayan S, Bahadur S, Thakur M, Pandey SN, Kumar P, et al. Anti-leishmanial activity of Agave americana L.– A traditional Indian medicinal plant. Indian J Tradit Knowl 2015;14:658-63. Sadeghi-Nejad B, Saki J, Khademvatan S, Nanaei S. In vitro antileishmanial activity of the medicinal plant – Satureja khuzestanica Jamzad. J Med Plants Res 2011;5:5912-5. Et-Touys A, Fellah H, Sebti F, Mniouil M, Aneb M, Elboury H, Talbaoui A, Dakka N, Sadak A, Bakri Y. In vitro antileishmanial activity of extracts from endemic Moroccan medicinal plant Salvia verbenaca (L.) Briq. ssp verbenaca Maire (S. clandestina batt. non L). Eur J Med Plants 2016;16:1-8. Sen G, Mandal S, Saha Roy S, Mukhopadhyay S, Biswas T. Therapeutic use of quercetin in the control of infection and anemia associated with visceral leishmaniasis. Free Radic Biol Med 2005;38:1257-64. Bajaj S, Wakode S. Standarization of Artabotrys hexapetalus. Int J PharmacognPhytochem Res 2016;8:398-406.